Shime Saba is vinegar-pickled mackerel, a classic dish from Japan. It is first cured in salt then washed with rice vinegar. Mackerel does not keep well. If it’s not consumed within the first several hours after being caught, it will deteriorate quickly. Therefore, the Japanese pickle it before serving as sushi. Clean and fillet the fish. Remove the remaining bones with a tweezer. Sprinkle salt on both side of the fillet in a glass bowl for 1 hr. Pat away salt and and dry the fish with paper towel. Place the fish in a ziploc bag and pour enough vinegar the cover the fish. Let it marinate for 25 minutes. 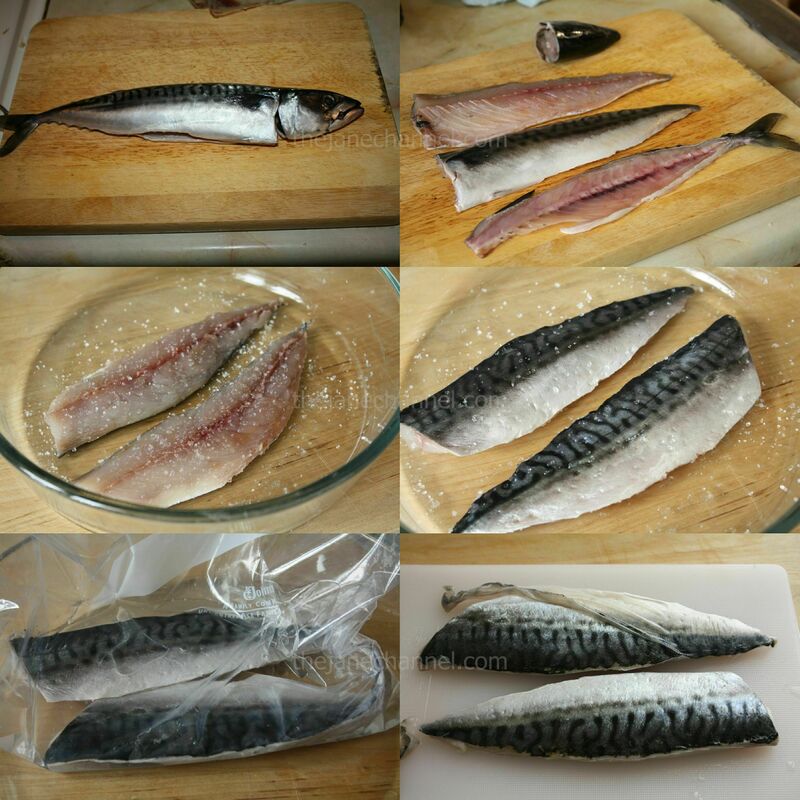 Peel off the skin from the mackerel. *Start by rubbing the corner of the fish fillet to peel off the skin. pieces. 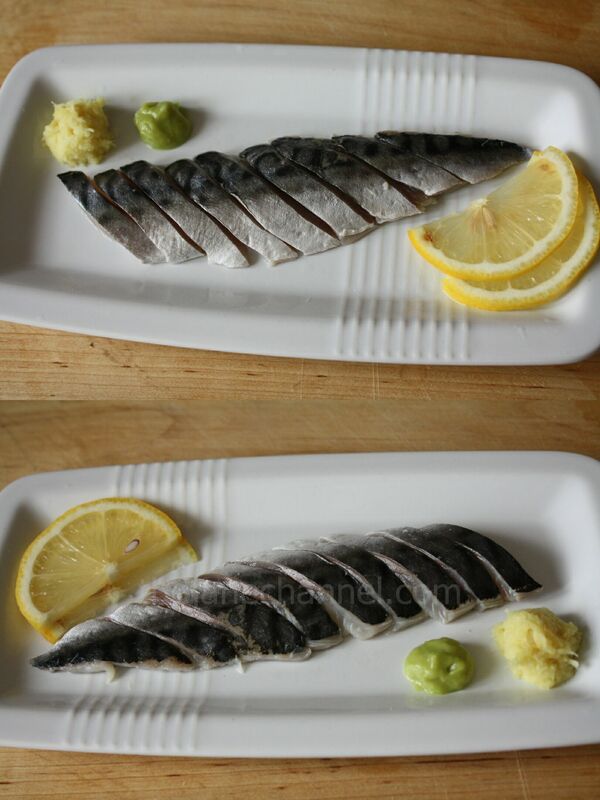 Serve shime saba with grated ginger, wasabi and lemon juice. This is great. Thanks. Where did you learn this technique? Thanks! My friend caught a lot of mackerels on one of his fishing trip. He learned the technique from his fishing friends. We did some research online, experimented and this gave the best results. You don’t scale mackerels because they don’t have scales. I didn’t go mackerel fishing this year. How come you’re not fishing this year? Lovely post, and such an exciting blog! Thrilled to have found you. Shime Saba is my favorite treat when eating sushi. My parents live on an island of the coast of Maine and we’ve always caught plenty of mackerel but always just grilled them. I’m looking forward to trying this. Does this need to be eaten right away or can this keep for a while in the refrigerator? Thanks!! P.S. I think there’s a typo on step #2 (fillet instead of second salt). Sounds tasty! Do steps 2 and 4 need to be done while the fish is refrigerated? Or should it be left in the kitchen? I did not put the fish in the fridge in Step 2 and 4.